I live in a house divided. That is, that I don’t eat meat and my husband does. Now, he’s very sweet and eats most everything I cook for him. But, occasionally he likes to have a steak or Carne Asada tacos or something else meaty that I won’t eat. This White Bean and Sausage Soup is one way I’ve found to get around this meat vs. no meat situation. We cook the sausages separately. I heat my Tofurky veggie links in a skillet or in the microwave, while he grills a sausage. Then we throw our cooked and heated sausages into the bowl and top with the cooked soup. It makes him happy, and keeps my dish meat-free. So, if you have picky eaters or dietary needs in your house, this is a great way to go. You can make pork sausages for some, veggie links for some, or chicken sausages for others without having to make any separate meals. 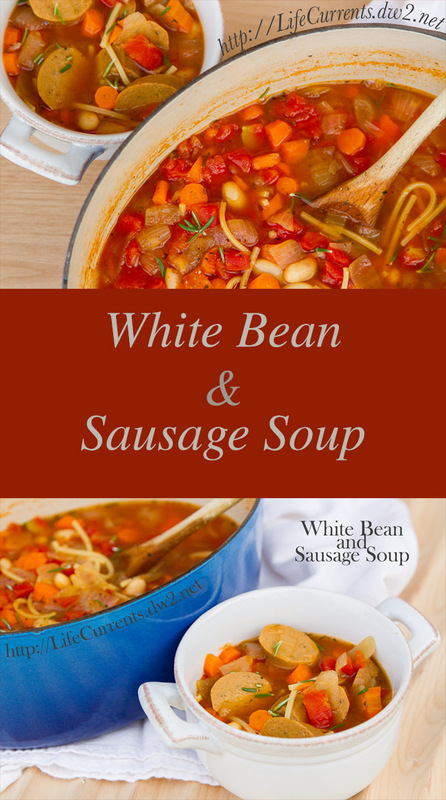 Time saver tip for this White Bean and Sausage Soup: I used those shredded carrots from the produce section at the grocery store once, and they worked great! Save yourself some chopping time and try these. I’ve also made the soup the night before, and reheated it the next day adding the pasta in during reheating. I like the fun addition of the broken spaghetti pieces, but you could also use any small pasta like ditalini, orzo, or even stars. Heat oil in a large saucepan over medium-high heat, swirling to coat pan. Add chopped onion and salt and sauté, stirring occasionally, until golden brown, about 20 minutes. If onions start to cook too quickly, add about ¼ cup water to slow the cooking and allow carmalization. Add carrots and dried thyme, and continue to cook for 5-7 more minutes. Add tomatoes, beans, a few grinds of fresh pepper, broth, and rosemary springs to pan. Bring to a boil, lower heat to simmer, and cook 5 minutes. Add broken spaghetti pieces, and cook for about 10 minutes until pasta is al dente (cooking time may vary based on pasta shape). Remove and discard rosemary stems. Taste for seasoning, adding more salt or pepper as desired. Add cooked sausages to the soup, or to individual bowls for serving. Garnish with additional rosemary if desired. Time saver: I used those shredded carrots once, worked great. Soup can be made ahead by leaving the pasta out and reheating and adding pasta. Looks so hearty and warming!… It’s supposed to get really cold later this week here in Florida and I’m thinking your soup would be perfect! That looks delicious, I love this hearty soup!! It is going to start snowing here again and this would be perfect to keep me warm!! What a beautiful and hearty soup recipe this is. Just what we need this winter! And…I love that you cooked the sausage separately to satisfy two life styles. I love this soup! I know what I am making next week–with turkey sausage! I like the idea very much of making the soup and cooking the ‘meat’ part separate for both tastes. That is certainly a great way to save cooking two separate meals. I also love the flavours in your soup, simple but also pack a punch on taste. Wonderful yummy! I love this idea! I could totally be vegetarian but my family are tried and true meat eaters. This recipe would make everyone happy! This is a yummy soup with lot’s of options. Love it. I sometimes add more meat to The Hubby’s dish because he likes the extra protein, which I do not need. This is a great way to make everyone happy. Pinned, YUM’d. I heard we’ll have lots of snow tomorrow. This would be so perfect for the cold weather – so comfortingly delicious! G’day A very hearty and healthy soup indeed Debi! Looks delicious, Debi! I do eat meat, but I like the fact that you can customize it to whatever the dietary needs of your family or guests! Pinning…you know I absolutely love soup! What a FABULOUS way to please both of you! Not only do the beans add flavor, they add more protein. I see myself feeling really good after finishing a bowl! Perfect for fall too! What a delicious hearty soup. I can’t wait to make this.